"I am looking for instructions on how to hook a three-horse hitch," says Russell Blake of Lyndonville, Vermont. "A friend and I would like to try this method to break a young horse with an experienced team. Any information would be appreciated." I use short lines (A) from the hame line ring to the outside horses. I make these out of halter chains or lead ropes, if I don't have enough leather. With the reins set up this way, the regular driving reins flare the horses out, and then they hold themselves back, reducing the pull on the reins needed to hold them. This feature becomes important if you get more horses abreast, like say 12 on a harrow. For a bigger hitch, just add more horses and short lines. IIf you are hooking a crazy one, or if you feel unsure of the green one, a jockey stick (B) going from collar to halter will keep him from jumping over the top of his mate. It is just a stick, such as a mower pitman, with a strap securely fastened on the end. The strap buckles around the collar at the throat and has a strong snap to go to the halter of the one being broken. A jockey stick reduces your control, as it allows less freedom for the horse to respond to the bit. Use it sparingly. 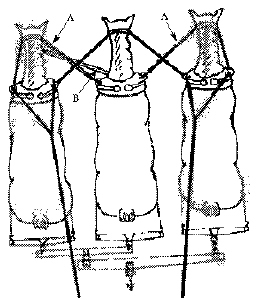 For a drill or other stiff-tongue application, offset the tongue about half way across the evener's long arm (between the single horse and the point of pull) and lengthen the tongue by the measurement labeled "A," representing the distance between the pin hole of the evener and the pin hole that connects the evener to the tripletree. Here is a temporary setup for a rigid autosteer wagon or manure spreader. Mount the pivoting arm 8" to 10" back from where the doubletree sits to increase the length of the tongue, so the neck yoke doesn't crowd the horses. The arm should be at least 18", or long enough to give the horses clearance from the tongue. 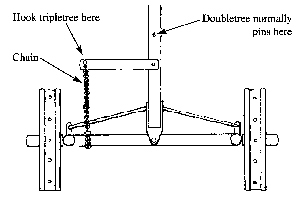 The chain to the axle provides pull. Evener 1999 issue of Rural Heritage magazine.